A partnership of the Kansas City Area Transportation Authority (RideKC) and BikeWalkKC’s Bike Share KC BCycle program, the Bike + Bus Pass allows users to access both bike share and bus from a single pass card. Users who maintain a 31-day bus pass for $50/month can upgrade their membership to the Bike + Bus Pass for no additional cost, adding unlimited 60-minute bike share trips to their transit options. Sign up for your Bike + Bus Pass at kc.bcycle.com. 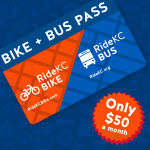 Once at the website, click the Join Now button and select the option to “Join as a Bike + Bus Pass user.” Users who already have a monthly bus pass and want to upgrade to the Bike + Bus Pass must re-sign up through the Kansas City BCycle website once their current month pass expires with RideKC.